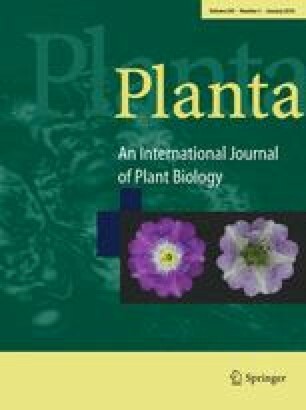 The contribution of the malate valve in the regulation of steady-state photosynthesis was studied in transgenic potato (Solanum tuberosum L. cv Désirée) plants with altered expression of plastidic NADP-dependent malate dehydrogenase (NADP-MDH; EC 1.1.1.82). Mutant plants were obtained after transformation with the homologous Nmdh gene in antisense orientation, or with the Nmdh gene from pea (Pisum sativum L.) in sense orientation. A total number of nine stable sense and antisense lines with 10% or 30%, and 400% of wild-type NADP-MDH capacity were selected. Intact chloroplasts were isolated from leaves of wild-type and mutant plants. In chloroplasts from sense transformants the increased enzyme amount was activated as in wild-type chloroplasts, but increased rates of oxaloacetate-dependent malate formation were only measured upon partial uncoupling. In contrast, chloroplasts from antisense transformants produced only little malate upon oxaloacetate addition. Measurements with intact leaves during steady-state photosynthesis yielded no differences in gas-exchange parameters and chlorophyll fluorescence. The leaf malate content was unchanged in NADP-MDH underexpressors, but twice as high in overexpressing plants. The altered NADP-MDH expression clearly influences the redox state of ferredoxin, especially in low light. Furthermore, the malate valve can successfully compete for electrons with cyclic electron flow, but the conditions under which this occurs are quite artificial.